I tried this dish at a Spanish tapas restaurant, and tried to copy it. I know it's far from low-fat, but every now and then, you've got to splurge! I guessed on the amounts, and didn't measure anything. :( So, this is all kinda approximate! Bring to a boil over medium heat stirring constantly, and as soon as you see it bubbling, reduce heat to low (or med-low, depending on your stove) and simmer until it's reduced by about half, stirring occasionally. This sounds sooooooo Good! Thanks for sharing! 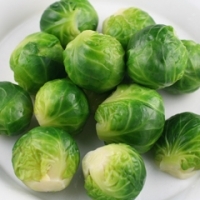 This sounds like a really good recipe...I like Brussel Sprouts,and have not had them quite this way. Like ninjamama's recipes? Never miss an upload!